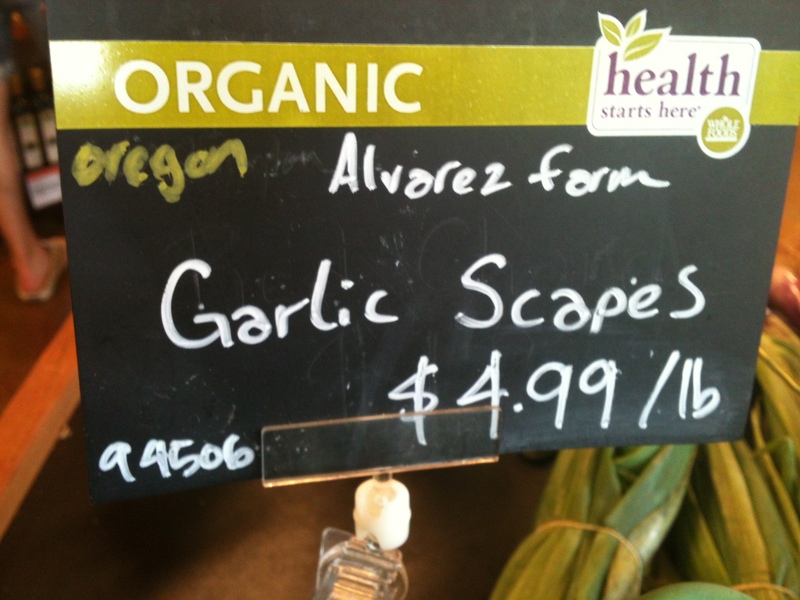 While in Whole Foods the other day, Jesse pointed out the basket of local garlic scapes. I’ve never bought or even eaten garlic scapes, but thought it’d be fun to give ’em a whirl. I figured we’d both like the garlic scapes since we enjoy the mature variety — garlic spears. I didn’t have any specific recipe in mind for the garlic scapes, so I searched good ol’ Google for ideas. Nothing really jumped out at me, but then I got the idea to make meatballs and serve them on top of sautéed garlic scapes and zucchini. 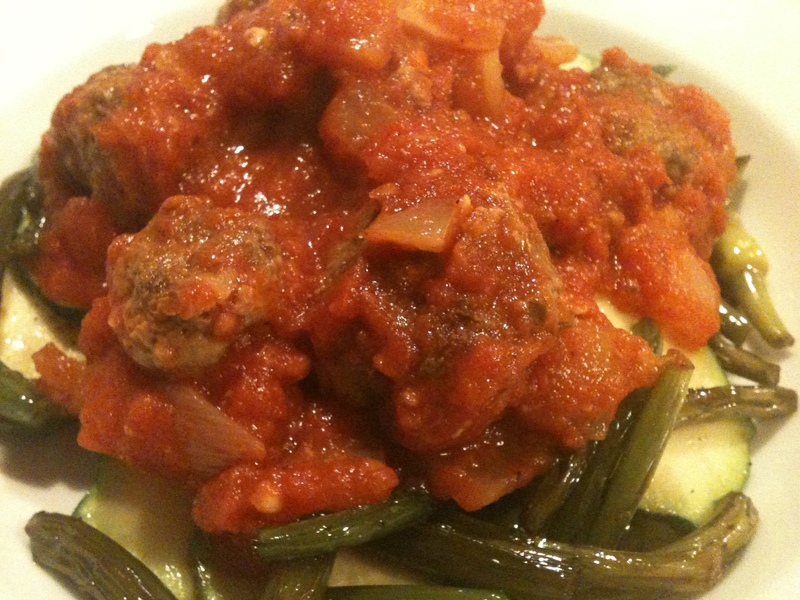 My easy paleo meatball recipe is foolproof. I’ve only ever made the recipe with ground turkey breast, so this time, I decided to use grass-fed beef. Both are delicious, but actually, I think I like the beef meatballs even more! Combine all ingredients in a large bowl and mix well with hands. Make tablespoon-sized balls and place on a baking sheet lined with foil. While the meatballs were baking, I sautéed 1/2 a yellow onion and one clove of minced garlic in a pan. Then I added a jar of Cucina Antica spicy arrabbiata sauce. I love this marinara sauce because it’s pure and simple ingredients, has no preservatives or additives, and no sugar added. It’s an easy shortcut on days I don’t feel like making homemade sauce or don’t have Pomi brand diced tomatoes on hand to do so, although making homemade sauce is pretty damn easy too. With the sauce simmering and the meatballs still baking, I got the garlic scapes going. To a heated pan, I added a bit of extra-virgin olive oil and then threw in the sliced garlic scapes. 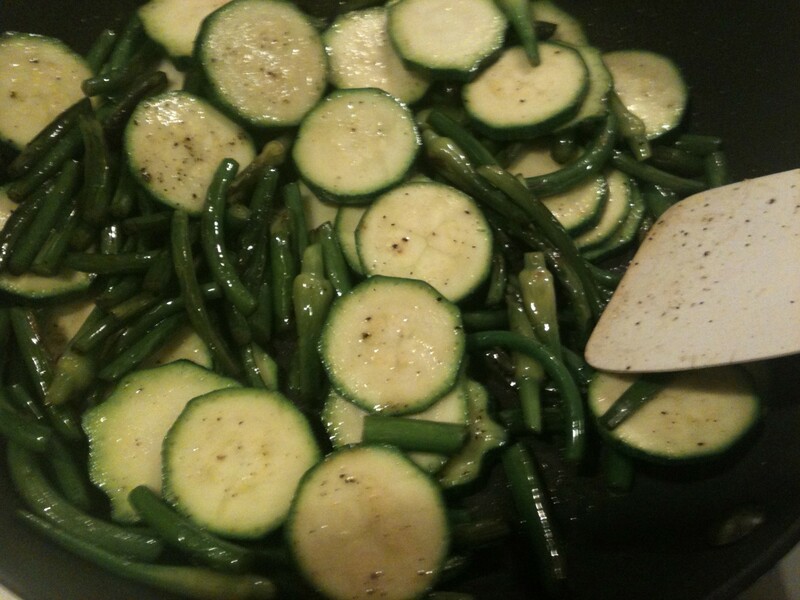 I let these sauté for a few minutes and then proceeded to add zucchini slices, sea salt and pepper. I let everything sauté together for a few more minutes and then set the burner to low to keep it warm. 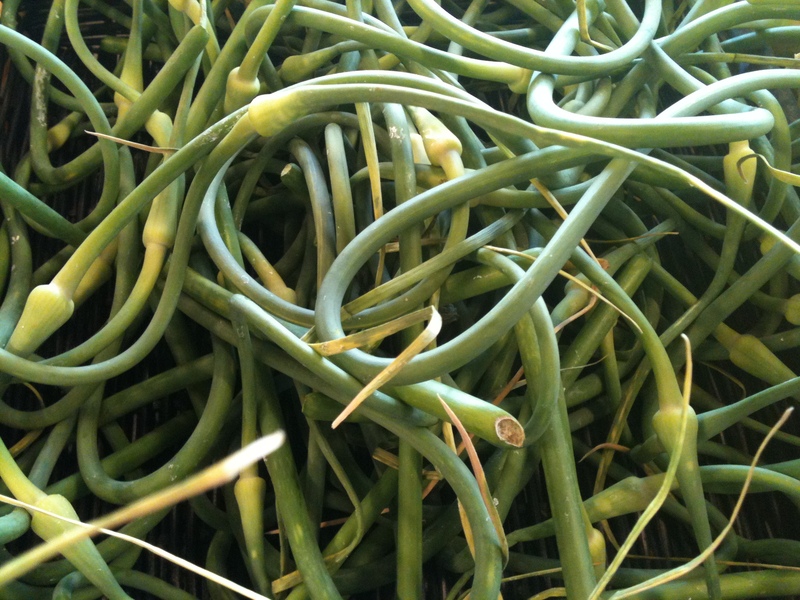 Are garlic scapes milder than an actual clove of garlic? Just curious. Yes, much, much milder. Same with the garlic spears. I bet you’d like them. If you see some around at the farmer’s market or something, give ’em a try! We had garlic scapes last night too! We grilled them in the barbeque like we would asparagus spears. It is so fun to eat the flower buds – yum. Yum! I wish I had a grill, so I could try them that way. I love grilled veggies! They look delicious (as do the meatballs) – I’ll definitely be keeping an eye out for these! They are delicious, but won’t be around for much longer, so be sure to grab ’em if you find some!